It's tax day in the United States! How are you doing? Is this a good thing (taxes have been filed for months? ), a bad thing (you're frantically finishing up!? ), or are you indifferent (hey, maybe you don't live in the United States!)? Many have made it a tradition to line up at the main post office for hours to ensure their taxes are postmarked by this date, but I am not the "last minute" type. I much prefer to be organized, and although you may have thought I was going to share how I organize my BoBunny products, instead I am going to show you how BoBunny is helping me stay organized, and ensures I am in the right place at the right time - with "My Life", a planner that is fun to use primarily because it uses one of my favorite all-time BoBunny lines - Love Shack. 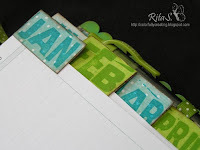 This purse-sized planner utilizes Day-Timer brand 2010 calendar and accessory pages, and to my delight, I found one of the chipboard mini-albums in my stash fit the pages perfectly! I painted the chipboard with a custom mixed color to match the blue-green colors of Love Shack, and topped with Shimmerz turquoise paint. 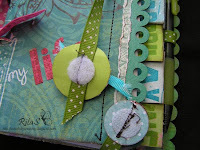 To ensure that my planner is quite durable, I used Mod Podge to adhere the patterned papers, and once dry, used stitching to secure the layers even more. Using the "Circle This Date" Stamp & Store set - I created extra large month tabs to make finding a month very easy. Chipboard pages throughout the planner provide easy-access division between sections, which include contact information for family and friends, notes, travel log and more. More images and details can be found on my personal blog, but for the sake of space, the main idea I would like to share on this particular mini album is the closure. I used an approximate 17" piece of 3/8" clover double dot ribbon, and used a sewing machine to stitch a 1" circle to one end, and a 1.5" circle to the other. 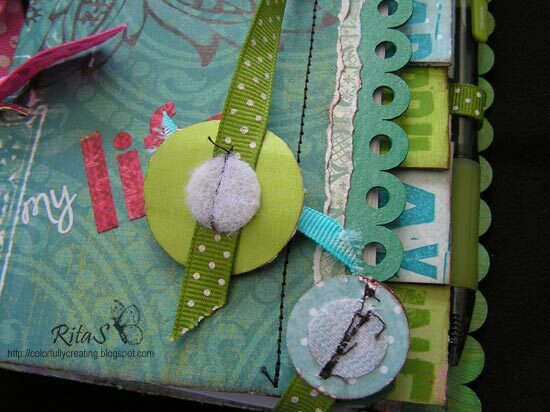 Velcro circle shapes are used, as shown, and caught in with the stitches. The smaller circle is secured on to the ribbon end that is to wrap around the bottom front of the album, and the larger circle goes on the opposite end as shown. 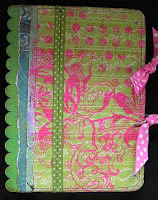 Along the backside of the planner, I stitched the full ribbon length approximately 1.25" from the outside scalloped edge. 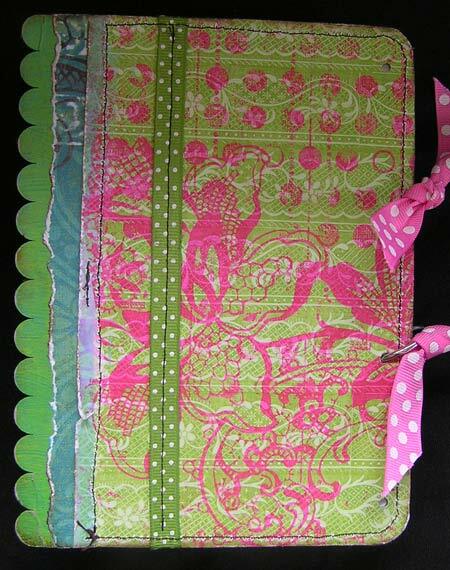 The ribbon, stitched to chipboard, is very durable and allows for constant use. With a bit of extra ribbon I stitched a loop of ribbon to the inside back cover, which allows it to hold my favorite pen. What I love best about my personal planner is the colors, the fun chipboard pages with a mix of edges, the shimmer I've painted on the papers - AND the fact that every year all I have to do is order new refill pages and I am set to meet the new year in organized fashion. If you would like to see more of this project please hop over to my blog to catch a glimpse. Thanks for visiting the BoBunny blog today - come back tomorrow to see how the BoBunny team is hopping into Spring! I don(t know the taxe day because i don't live in USA but in France. i find your project beautiful!!! thanks for this idea ! What a great organizer Rita! Thanks so much for sharing this! 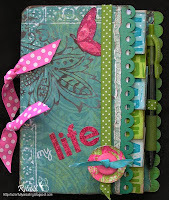 love the organizer! thanks for sharing. I love that color & the whole thing is SO my style!! Our taxes were done in Feb & we already have our refunds. You don't tend to hold off until the last minute when you find you're getting money back! LOL! !